Square or rectangular port sliding wall penstocks sealed on all 4 sides. 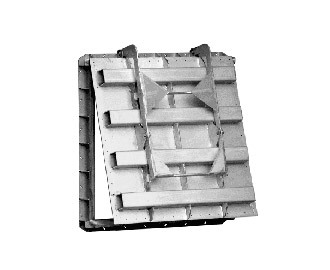 Used for on-off or control applications in wells, tanks, pipe outlets, etc. Carbon or stainless steel fabricated construction, with tight sealing by means of elastomer seals. 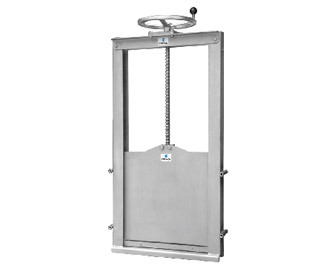 Orbinox UK have a variety of Penstocks available in a wide range of dimensions to suit many different pressure heads. Used for on-off or control applications in open channels. Carbon or stainless steel fabricated construction, with tight sealing by means of an elastomer seal. 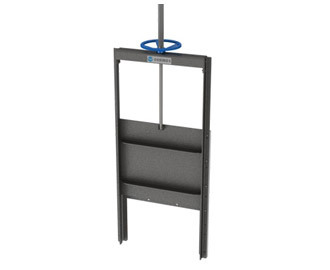 Round swing check gate to be wall-mounted or flanged, intended to prevent backflow and commonly installed at the end of a line, as a check valve. May include a counterweight for adjustment and control of the opening. Square or rectangular swing check gate to be wall-mounted or flanged, intended to prevent backflow and commonly installed at the end of a line, as a check valve. Carbon or stainless steel fabricated construction, with tight sealing by means of elastomer seal. 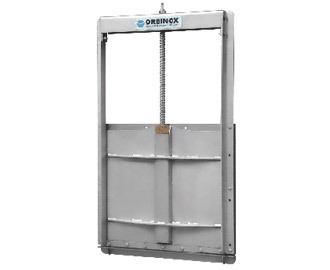 The Orbinox model RB weir gate is designed for downward opening applications where a more accurate flow control is required. The water flows over the top of the slide permitting a constant upstream water elevation. The RB model weir gate is available from sizes 6”x6” (150mm x 150mm) up to 80”x80” (1200mm x 1200mm). The sealing system is incorporated on 3 sides (both laterals and bottom), resulting in a perfect seal without the need of wedges on the gate. This unique design allows to achieve watertight performance on seating and unseating pressure conditions (bi-directional). 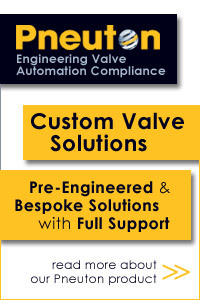 In addition, a 4 side sealing system is available. 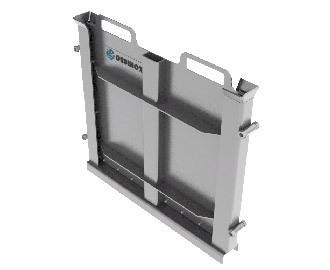 The Orbinox model AG Stop Gate is designed for open channel installation in waste water treatment plants, irrigation, hydraulic works and hydro-electric power plants. The slide is hand operated or hoist operated for larger sizes. 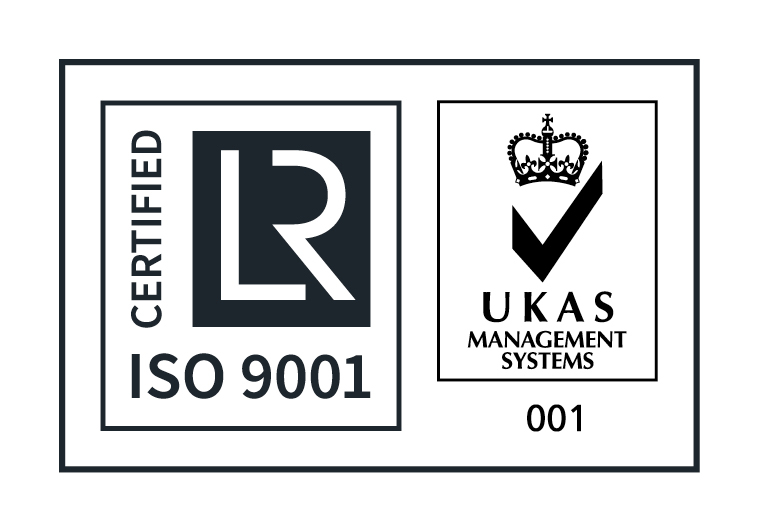 The sealing system is incorporated on both laterals and bottom area of the slide, resulting in a substantially watertight seal without the nned of wedges on the gate. From sizes 6″ x 6″ (150mm x 150mm) to 80″x80″ (2000mm x 2000mm), the AG model has a unique “lip” type seal design. The leakage rate on the Orbinox stop gate is lower than the maximum alllowable recommended by AWWA (C513-05) under normal conditions. The frame of the AG model is typically embedded in a concrete channel for both uni-directional (seating head only) or bi-directional sealing (seating and unseating water head). 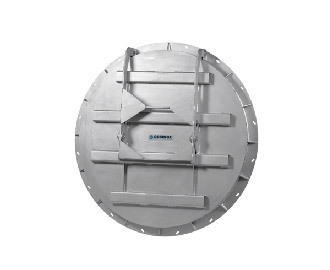 The Orbinox model SL Stop Log is designed for open channel installations in waste water treatment plants, irrigation, hydraulic works and hydro-electric power plants. The slide is formed by several logs that fit on top of each other in the frame. By adding or removing logs, the SL model allows to control the flow of a channel in a economical way. The sealing system is incorporated on both laterals and bottom area of each log, resulting in a perfect seal without the need of wedges on the gate. From sizes 6”x 6” (150mm x 150mm) to 80” x 80” (2000mm x 2000mm), the SL model has a unique „lip‟ type seal design. 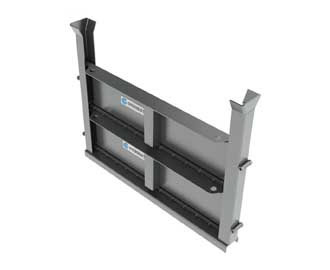 The frame of the SL model is typically embedded in a concrete, but can also be designed to be wall mounted or face mounted in a existing channel. The Orbinox model SA Aluminum Stop Log is designed for open channel installations for temporary isolation and flow control. Stop Logs are ideal for maintenance and repair works or flood control and diversion. The logs are made of extruded aluminum and are very easy to handle due to their light weight. The logs are stacked on top of each other in the frame guides. The water level is controlled by adding or removing logs. The sealing systm is bidirectional (suitable for flows in either direction) and allows to achieve very low leakage rates. 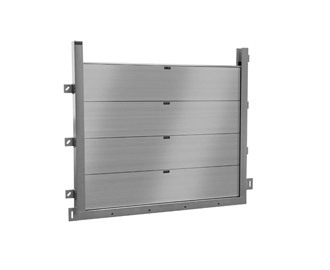 The frame can be made of aluminum or stainless steel and it can designed to be embedded in concrete, wall mount or face mounted in a existing channel.